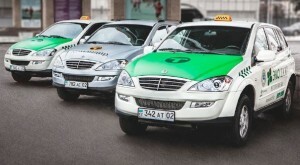 There are many official and semi-official taxi services all over Almaty. You can find taxis parked outside popular venues like the Airport and shopping malls. At the airport, be ready to have many people offering you a ride as you leave the building. We highly recommend to make a deal for a ride directly with the taxi driver, preferably if he speaks and understands at least basic English. Ideally, book a transfer with your hotel to ensure appropriate prices. Typically, the price of a ride will cost up to 2,000 KZT to/ from the city center from/ to the airport. UBERs are available by using the app.